Modern Schools see transparency and sharing as fundamental to a powerful learning environment. In most schools, very little is known from one teacher or student to the next about what happens in classrooms down the hall, and even less across the district. The “let me close my door and teach” mentality still permeates most school cultures, and there is very little collaboration or articulation of learning across disciplines. Few teachers create windows into their classrooms using online websites or apps, and students rarely publish their school work in local or global spaces. One of the greatest affordances of the Web is the ability to learn from one another, but that can only happen when people share. Increasingly, there is an expectation from employers and others that students have built an online portfolio of work that shows creativity, curiosity, collaboration, and persistence. Work that is shared with a variety of audiences also deepens that learning process. In addition, online “reputation management” is now a necessary skill in order to navigate the Web successfully. Think of having “thin-walled” classrooms where students and teachers interact with other learners from around the globe on a regular basis. Encourage teachers to create classroom portfolios for student and teacher work that model the forms of online presence that can expand learning opportunities. Create learning spaces that facilitate transparency. How much do students and teachers learn from one another across classrooms and experiences? What amount of student and teacher work is shared with the world? What expectations are there around sharing work on a local and global stage? Modern Schools use technology as an amplifier for learning, creating, connecting, communicating, and problem solving. Despite increased access to technology in most schools, transformative uses for student and teacher learning are exceedingly rare. Technology is primarily a teaching tool not a learning tool. Laptop, tablet, BYOD, and smartphone uses are usually highly restricted and unimaginative. While some schools are offering “Maker Spaces” and coding “courses,” these and others are primarily half measures that are not supported by a school culture where technology is an essential for self-determined learning rather than an add on. Technology is increasingly ubiquitous in the modern world, and Internet access continues to grow. In today's globally connected work and life environment, everyone is expected to have skills that allow them to both consume and create content for the Web and that show an ability to connect, collaborate, and problem solve. Similarly, a high degree of media, information, and technology literacy is a prerequisite for success in most fields of study and work. Schools of Modern Learning focus on creating cultures of learning using technology. They see devices and Internet access as a way to amplify learning and to move agency over learning to the learner, to allow them to explore powerful ideas that are often at a level of complexity far beyond what we might previously have believed was possible. To that end, schools must focus on the constructionist potentials of technology over the productivity potentials by emphasizing the creation of complex, beautiful, meaningful, original work by both students and teachers. How are students and teachers using technology to learn? What are students and teachers doing with technology that they couldn’t do without it? To what extent are personal devices controlled by the user? Modern Schools develop and communicate in powerful ways new stories of learning, teaching, and modern contexts for schooling. One of the biggest barriers to meaningful change in schools is the extent to which the traditional story of education is rooted in people’s minds, both adults and children. Most parents as well as teachers and students are unaware of the larger shifts currently happening, have no real practice around learning more about them, and have no alternative vision of a modern school experience. Most schools do little if anything in terms of articulating the urgency for change and telling a new story of learning to their constituents. Traditional systems and structures worked when information, knowledge, teachers, and technologies were scarce. But the last 10 years have changed that reality, and now all of those things can be found in abundance online. Schools were not built for abundance, and they are not preparing their students for abundance in those terms. In order for meaningful, sustainable change to occur, however, the entire school community must have a context for the why, what, and how of change. Their awareness of the impact of this changing context on their child’s schooling should precede the necessary changes within the school. Build communication channels via the Web (e.g. Facebook and Twitter), e-mail, newsletters and mobile (e.g. Snapchat and Instagram) to connect the school community to resources and stories that challenge the traditional narrative. Share examples of and the reasoning behind your modern mission and vision on a regular basis. Make understanding global and technological change a part of every classroom, and engage in ongoing discussions around the impacts. How is the school or district building the capacity of the community to understand the changes required for a modern education? What is the narrative of learning in the school? How does the entire school community engage in an ongoing conversation that develops a shared understanding of mission, learning, etc.? Modern Schools encourage community wide participation in the equitable, effective education of children. Most schools do very little to solicit input on decision making aside from monthly board meetings or the occasional special event. Schools in general are the least democratic institutions in society as students usually have little or no say in the day to day experience. If anything, participation outside of a small nucleus of decision makers is discouraged regardless how many people may be affected. Schools cannot prepare students as citizens if they are not given real life opportunities to be citizens beforehand. Given the current climate regarding locally run education, it’s even more important that schools are seen as an active partner in the larger community where everyone is invested in the outcomes. Find ways to keep the lights on and invite community members in for learning after hours. Tap into local experts who can inform classroom practice and also help expand discussions about mission and vision. Invite parents into classrooms to volunteer or to participate on advisory boards discussing any variety of decisions. Similarly, create opportunities for students to offer input on all aspects of school decision making. How are school community members engaged in decision making? In what ways do parents play a role in classrooms? How are school buildings used by the school community after school hours? How is diversity nurtured and celebrated? Modern Schools embrace and anticipate constant change and evolution. By and large, schools are not comfortable with change. In our experience, most “innovation” that schools attempt are usually either neutered or discontinued completely within a short period of time. “Change” is incremental and rarely challenges to any great degree the traditional systems and structures that are currently in place. Instead of seeking to understand and embrace the new, school cultures tend to undermine it in policy and in practice. Basically, change that cannot be subsumed within the existing narrative of education is to be feared and rejected. We now live in a moment of “perpetual beta” where very few traditional organizations or industries will survive by standing pat. This is already obvious in music, journalism, politics, and business where huge technological and cultural shifts have forced a rethinking of existing paths to success. Technological, environmental, and cultural change are speeding up, not slowing down, and schools that cannot adapt put both their students and their own existence at risk. Expect students and teachers to do research and development (“R&D”) in their classrooms on a regular basis. It should be embedded within the culture of the school; not for the adoption of fads or trends for their own sake, but for the exploration and discovery of new ways of engaging modern learners with powerful ideas. Create a vision for classrooms where innovation and inquiry are at the core instead of at the edges. Make time for regular discussions on what changes are happening, and reflect on how to make new systems and practices in school more sustainable. How are teachers and students engaged in ongoing research and development about their work? Is there a culture that supports innovation and trying new things? What strategies are in place to stay abreast of change both inside and outside of education? So, how do you become a school of modern learning? Start by taking our audit. Becoming a School of Modern Learning as defined by these 10 Principles isn't easy. It takes a concerted effort over time to embrace and implement these ideas. 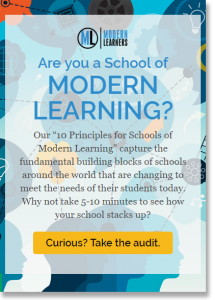 Crucial to that process is understanding what your starting point is which is why we created the 10 Principles for Schools of Modern Learning Audit. We've found from our experience with over 500 schools in 22 countries that schools on the journey to modern learning adopt these principles. By taking this audit, you'll be able to evaluate where your school is on your journey to Modern Learning, and identify what your next steps need to be. Our team can guide you in the process of becoming a School of Modern Learning.